February 1, 2008 - Recent rains have enticed endangered steelhead trout to make a spawning run up the Ventura River. 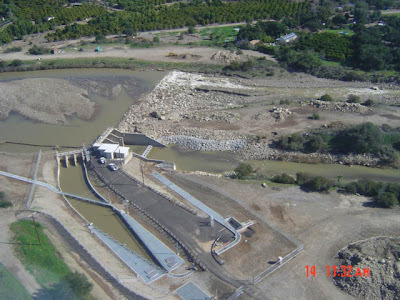 On Thursday January 31, 2008 the first adult steelhead of the year was detected by new camera’s installed at Casitas’ Robles Fish Passage Facility, a fish ladder completed in December of 2004 to allow steelhead to swim upstream on the Ventura River. Scott Lewis, Casitas’ Fisheries Biologist, said, “Preliminary results indicate the first adult steelhead swam past our fish counter at about 1:30 p.m. on Thursday. 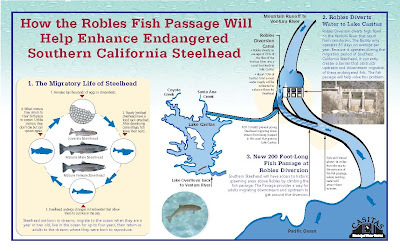 The fish was estimated to be about 21 inches long.” Lewis determined that this fish is likely a steelhead by reviewing photos taken of the fish, as it passed through the Robles Fish Passage Facility, and comparing characteristics known to be associated with adult steelhead. “This is exciting news that we have been able to identify steelhead utilizing our fish ladder,” stated Lewis. A second adult steelhead was spotted at 2:45 a.m. this Friday and was estimated to be approximately 25 inches long. Casitas will continuously be monitoring the fish passage for any additional steelhead migration occurring on the Ventura River. A 13-inch rainbow trout was also recorded at about 5:00 a.m. on Friday morning. Steelhead are rainbow trout that migrate to the ocean to grow much larger from abundant ocean food sources and return to freshwater to spawn. After spending one to two years in freshwater, the juvenile fish migrate downstream to the ocean were they spend 1-2 years growing to adults. The rainbow trout, on the other hand, will spend their entire lives in fresh water and spawn when they become adults. This video is from 2005 and shows how the Vaki Riverwatcher fish counter detects migrating adults. 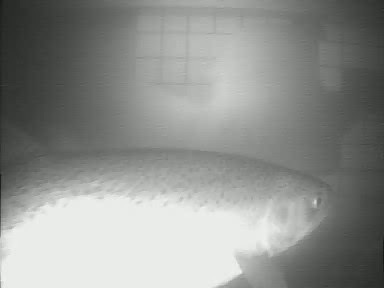 The scale in the background is used to approximate the size of any fish passing through. This is an aerial view of the diversion dam and fish passage facility following the high flows of the 2005 storms. Robles diverts water into Lake Casitas from the Ventura River when enough flow is present. Historically, the facility also diverted steelhead smolt into the lake, while blocking upstream migration of adult fish. The fish passage facility was designed to solve these problems by screening diverted water and providing an artificial "ladder" over the diversion dam. Migrating fish can now swim upstream as far as Matilija Dam and the Ojai Quarry.